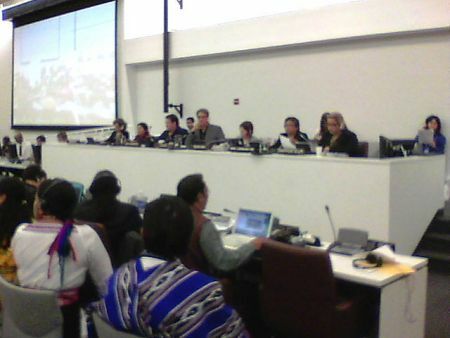 The 11th Session of the top forum for Indigenous peoples in the world began with a lurch. The sixteen-member Forum elected, by acclamation, Grand Chief Edward John to be their Chair. The announcement was made during a preliminary meeting, May 6, 2012, before the two week meeting in New York City. Hailing from Tl'azt'en (northern BC), this Chief will be familiar to anyone who has followed the machinations of the BC treaty process over the last twenty years: John was the founding Chair of the First Nations Summit, an organization formed to “represent First Nations” involved with the BC Treaty Commission (BCTC). Perhaps, in 1992, the election of a man affiliated with this Summit to Chair the Permanent Forum on Indigenous Issues – understood to be advancing the cause of self-determination, land rights, and everything else contained in the Declaration on the Rights of Indigenous Peoples, would not be an obvious contradiction in terms. However, twenty years later, after the ratification of two extinguishment treaties in that process, this election must be a point of confusion. When Nisga’a ratified an agreement with British Columbia and Canada in 2000, they released the Nisga’a claim to 100 per cent of their traditional territory in exchange for about 8 per cent of the land back, in Fee Simple Title and with BC holding the underlying title. No alarm bells were rung by Chief John. Every First Nation in BC was watching that process very closely, as they believed, rightly, that future negotiations in the BC treaty process would follow the Nisga’a template. Tsawwassen First Nation releases Canada, British Columbia and all other persons from all claims, demands, actions, or proceedings, of whatever kind, and whether known or unknown, that the Tsawwassen First Nation ever had, now has or may have in the future, relating to or arising from any act, or omission, before the effective date that may have affected or infringed any aboriginal rights, including aboriginal title, in Canada of the Tsawwassen First Nation. This clause is also to be found in the Nisga’a Agreement. It is a surrender, rather than the basis of continuing nation-to-nation relations. Tsawwassen made these concessions for a settlement of less than 1 per cent of their traditional territory, held in Fee Simple. The total cash value of the deal was $33.6 million plus self-government funding of $2.9 million annually over the first five years of the treaty – according to government press releases. John is still the Chair of the First Nations Summit today. The role of the First Nations Summit in these “negotiations” is, in part, to give advice to the federal government for the allocation of treaty negotiating loans to First Nations for the purpose of developing and ratifying Final Agreements under the BC Treaty Commission. These negotiating allowances average a million dollars a year, and the 80 per cent which is a loan comes due the moment a First Nation leaves the process or begins implementation of their Final Agreement. Staying at the table is an offer most First Nations cannot afford to refuse, especially for those who have been at it since 1993, but the only alternative is to ratify an Agreement and extinguish title. Treaty negotiating loans are not included in government audits of First Nations accounts – perhaps because such a loan would immediately place that community in third party remedial management. Chief John has stayed with the process throughout and failed to take any meaningful action to indicate his disapproval of the situation, if he does indeed disapprove. He obviously hasn’t resigned in protest. Since Morales’ statements, letters, and FNUPA actions, which included blockading a Nanaimo ferry sailing with canoes, the HTG has been in abeyance from the negotiating table and entered a petition describing the exhaustion of domestic remedies within Canada to resolve the outstanding land title issue. That Petition was heard in Washington last year by the Organization of American States’ Inter-American Commission on Human Rights, and a result has not yet been announced. As she spoke, Chief John was sitting in front of her. The CCP is the basic platform of the BC negotiations, in direct contrast with the 19 Recommendations by the BC Task Force forming the terms of reference or guidelines for the process in 1992. Those guidelines attracted people to the process because they said, in sum, that the government would be open to all types of discussion and conclusions that would lead to real, workable treaties. While acknowledging the information that the “cede, release and surrender” approach to Aboriginal land titles has been abandoned by the State party (Canada) in favour of “modification” and “non-assertion” approaches, the Committee remains concerned about the lack of perceptible difference in results of these new approaches in comparison to the previous approach. To date, only four Final Agreements have resulted from the negotiating process implemented by the BC Treaty Commission, one rejected in the community ratification vote, one awaiting federal approval, and two in implementation, but all of them leading to the extinguishment of title of the Indigenous nations concerned. Aside from these, the negotiation process in BC remains stalled largely due to the evident desire of the governments to pursue policies of extinguishment of Indigenous sovereignty rights, and the equally evident desire of the BC Indigenous nations to resist this demand. But they cannot leave the process without triggering the maturation of the negotiating loan. While Chief John and the Summit Executive exchange polite letters and press releases with Canadian government officials conducting studies on the BC treaty process, and welcoming “recommendations which outline how the federal government can accelerate treaty negotiations in BC” (First Nations Summit Press Release: May 4, 2012), the cost of remaining in the process grows – and the process remains one of municipalization of Indigenous nations which currently have the internationally recognized right to self-determination and demonstrable title to their territories. Sliammon First Nation is about to go to a ratification vote this summer. So called "Canada's” ignorance of our existing and affirmed Title and Rights and the threat of limited financial support for non-participating Nations forced my people into entering the treaty process. And they keep us on the negotiation table, by threatening to demand all the negotiation funds back at once or to limit our financial support by the federal government accordingly. For my Nation it is impossible to pay the amount back or to forgo financial aid. Moreover, the longer the process takes the more power shifts to the benefit of so called “Canada” and “BC”, because in the end any agreement resulting in any kind of payment is better than none, given the fact that we have to pay the loans back. Loans that would not even be necessary without Canada's wrong-doings and their ignorance of our existing Title and Rights. We are advised by the Honourable Minister of Indian and Northern Affairs Jim Prentice that these twelve people (the IN-SHUCK-ch Treaty Society) have since 1993 borrowed $9,717,059.00 to engage in these negotiations. We remind that those are the debts of those people alone. In fact, on October 15, 1994, at a duly convened Samahquam General Assembly, for said purpose, the membership specifically voted, by majority, “no” to any proposed Loan Agreements emanating from the British Columbia Treaty Commission. Most of the original nineteen recommendations of the British Columbia Task Force, which were agreed on by the three negotiating parties forming the BC treaty process, have long since been abandoned: for example, every Final Agreement produced has been taken to court by neighbouring nations for failure to resolve “overlap” claims. Most negotiations currently underway were initiated by a small minority of community members – over whom the rest of the people in the communities cannot regain control: court actions such as Spookw v.Gitxsan Treaty Society et al, 2011, and the recent blockade by members of the Gitxsan against the Gitxsan Treaty Society show how serious this flaw is. By insisting that the small, mostly isolated communities are “autonomous” in their dealings with the treaty process, the First Nations Summit has absolved itself of any responsibility for those First Nations which it claims to represent. Both the Tsawwassen and Maa-nulth Final Agreements were ratified in votes where "public relations crisis-management" firms were hired by the government to produce pro-treaty propaganda, and where treaty negotiating teams promoted only those prominent community members who endorsed the Final Agreement, and where immediate fiscal rewards for a "yes" vote were offered to community members. I would like to reference some very key items that raise very serious question about the legitimacy of this vote. Under “Members Benefits” two cash incentives to voters are stated.“ In particular it states that “each elder over 60 will receive $15,000, shortly after ratification day” and “approximately $1,000 per member on Effective Date.” I feel that these cash incentive are a bribe to vote YES to the Final Agreement. These are the cash guarantees that are written right into the agreement and that are openly promoted, but I know that there are additional monies paid out just to get people to vote on this agreement. As already set out above, the vote will take place without meeting basic requirements for such a fundamental, constitutional vote. People are not informed about the real content of the agreement they are voting on, but rather the provincial government is paying for the preparation of propaganda material that points to the few mainly cash incentives of the agreement, but fails to point out all the downfalls, such as the extinguishment of our Aboriginal Title to our territories, the loss of the tax exemption and the long-term loss of programs and services that will all result in the further impoverishment of our people. Many feel that, as a lawyer whose organization gives advice on the allocation of negotiating loans, Chief John is and was aware of how the loan process itself would leave small and isolated communities trapped between descending into a deeper cycle of debt the longer they stuck to their negotiating claims - or acceding to the extinguishment terms offered by Canada, which can afford to wait the process out. That message has been clearly and repeatedly delivered to the Executive of the First Nations Summit by such groups as the First Nations Unity Protocol, as early as 2006. But Chief John is considered respectable. Earlier this year he received a National Aboriginal Achievement Award, and he is on the Board of Cultural Survival, an international agency which claims to, "publicize Indigenous Peoples' issues through our award-winning publications; mount letter-writing campaigns and other advocacy efforts to stop environmental destruction and abuses of Native Peoples' rights; and we work on the ground in Indigenous communities, always at their invitation." Most of the Indigenous nations whose territories lie within the Canadian Province of British Columbia have no treaties with Canada. The recent appearance of Edward John on the Aboriginal People’s Television Network to state that he does not support extinguishment is not an adequate gesture, when read together with his continued involvement, as Chair of the First Nations Summit, in this well-documented extinguishment process. The Permanent Forum on Indigenous Issues sends the world a mixed message in its choice of Chair, when considering its stated mandate. Perhaps the message will become very clear when the Permanent Forum reports its recommendations, which will be received by the UN Economic and Social Council to advise member states on Indigenous peoples’ rights the world over. Thanks for the insight into some of the treaty process. the state should be paying any treaty costs? States shall consult and cooperate in good faith with the indigenous peoples concerned through their own representative institutions in order to obtain their free, prior and informed consent before adopting and implementing legislative or administrative measures that may effect them. Ed John at the UN? on behalf of Indigenous sovereignty is completely outrageous.! Why not just send the Indian Affairs Minister? And the fact that he was voted in by acclamation by the other members of the Permanent Forum on Indigenous Issues, tells me that he is obviously in good company there. No wonder grass-roots uprisings like Gustafsen Lake keep happening unlike anything positive out of the high-priced sellouts at the UN! BC. In saying that I have listened to Ed and the BC Summit on this issue and they have taken the middle of the road or fence sat. Is that a good position? For them perhaps but not for those of use that have huge debts to repay under the present structure. We had thought the BC Native Summit would be an advocate for the tribes of BC but sadly view themselves as a facilitating agency rather than Native and proud of it. In my opinion any representation is better than no representation at all but sometimes this can be waste because a non opinion is costing all of us Native people money by the hour and we started the process disadvantaged and near pennyless. After 20 years what have to show for it? Debt and more debt. My saying is "Are you or are you not a Native Nation? If you say you are, then act like it" Perhaps when you do, you could do great things like stopping the pollution, stopping the massive clearcuts, saving the salmon, stopping the many oil spills and take responsiblity for the land and the resources that you actually own. How many court cases will it take for our leaders to understand that NATIVE PEOPLES ABORIGINAL RIGHT HAS BEEN RECOGNIZED BY THE HIGHEST COURTS IN THE LAND. Time in and time out, yet doubt in our leaders mind are always there. Fence sitting piles up the debt and we as Native people cannot afford more debt. DO SOMETHING POSITIVE FOR A CHANGE, TAKE RESPONSIBLITY AND BE ACCOUNTABLE. The implementation of "local self-government" via Canadian Corporations of "First Nations" constituencies, is the very same tactic used to DOMESTICATE the Native American federally recognized tribes under the 1943 Howard-Wheeler Act that produced the elective systems on the reservations. This tactic allows both governments to argue in the international arena that they are not in violation of the Right of Self Determination of Indigenous Peoples by having allowed these "non-self governing territories" and their constituencies of Indigenous Peoples the option of voluntary INTEGRATION into the metropolitan state. It is sad that Ms. Coast bases her objections to John's election as the Chair of the UN Permanent Forum on Indigenous Issues solely on his complicity with "the extinguishment clause." John has a vile reputation as the result of members of his own band (some of whom have since disappeared) coming forward and testifying to his involvment in trafficking crack cocaine throughout northern reserves and the sexual trafficking of native women and children. Deceased Squamish Nation elder Harriet Nahanee also testified about John's shocking criminal activities. While it is certainly is in the best interest of UN controllers to entitle and create an easily manipulated overclass of corrupted "status" leaders and disenfranchise 95% of the current population of British Columbia, it is shameful to see Ms. Coast legitimize a repugnant character like John in order to promote an agenda that awards special rights and privileges to her own status child. The division of the population of modern BC into "indigenous" and "colonists" is just another divide and conquer strategy that will use BC First Nations as a stepping stone for the privatization of lands and resources that actually belong to all of us. Perhaps Ms.Coast's limited hangout on this subject has something to do with the reality that a gag order on any media reporting of accusations of criminal actions by John has been in place since 2002. Another 2 Years of 'Fast Eddie' At the UN: Who Put Him Back In? Here we go again..."The appointed members nominated by indigenous organizations include Edward John"